The 38-page report, “Razed to the Ground: Syria’s Unlawful Neighborhood Demolitions in 2012-2013,” documents seven cases of large-scale demolitions with explosives and bulldozers that violated the laws of war. The demolitions either served no necessary military purpose and appeared to intentionally punish the civilian population or caused disproportionate harm to civilians, Human Rights Watch found. The Syrian government, as part of its Geneva-2 negotiations, should make a commitment to immediately end demolitions that violate international law and to compensate and provide alternative housing to the victims, Human Rights Watch said. The United Nations Security Council should refer the situation in Syria to the International Criminal Court (ICC). 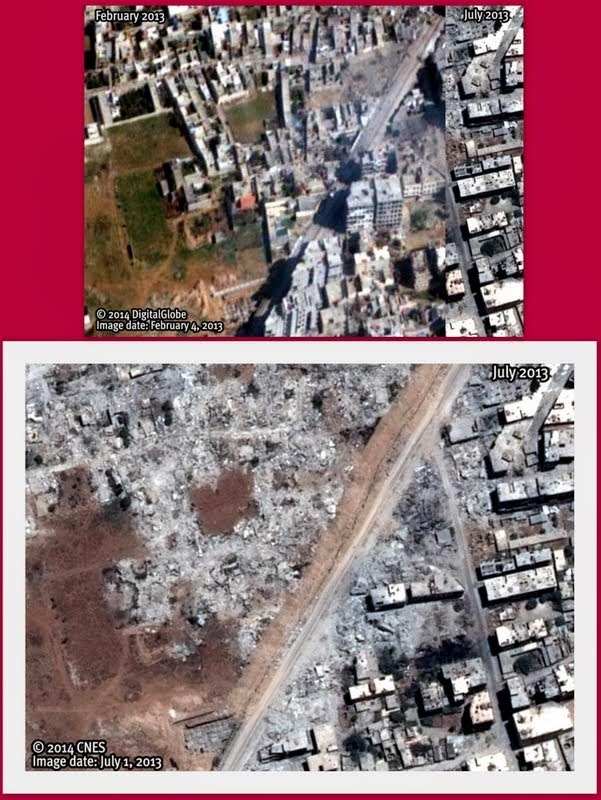 The seven cases Human Rights Watch documented took place between July 2012 and July 2013 in the following areas: the Masha’ al-Arb’een and Wadi al-Joz neighborhoods in Hama, and the Qaboun, Tadamon, Barzeh, Mazzeh military airport, and Harran Al-‘Awamid neighborhoods in and near Damascus. The total building area demolished, based on analysis of the satellite imagery, is at least 145 hectares – an area equivalent to about 200 soccer fields. Many of the demolished buildings were apartment blocks several stories high, some as many as eight. Thousands of families have lost their homes as a result of these demolitions. All of the affected neighborhoods were widely considered by the authorities and by witnesses interviewed by Human Rights Watch to be opposition strongholds. Government officials and pro-government media outlets have claimed that the demolitions were part of urban planning efforts or removal of illegally constructed buildings. However, the demolitions were supervised by military forces and often followed fighting in the areas between government and opposition forces. As far as Human Rights Watch has been able to determine, there have been no similar demolitions in areas that generally support the government, although many houses in those areas were also allegedly built without the necessary permits. 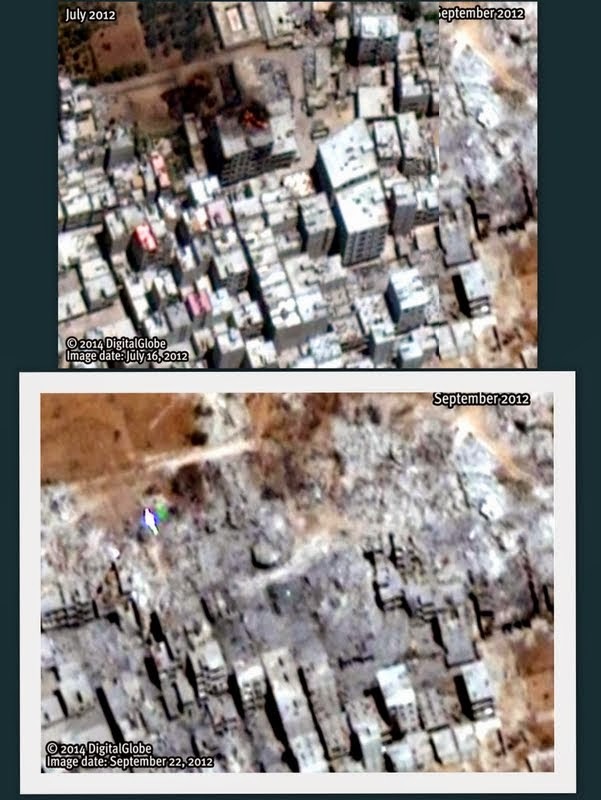 Commenting on the demolitions in an interview with an international journalist in October 2012, the governor of the Damascus countryside, Hussein Makhlouf, also explicitly stated that the demolitions were essential to drive out opposition fighters. Some of the demolitions took place around government military or strategic sites that opposition forces had attacked. While the authorities might have been justified in taking some targeted measures to protect these military or strategic locations, the destruction of hundreds of residential buildings, in some cases kilometers away, appears to have been disproportionate and to have violated international law. Local residents told Human Rights Watch government forces gave little or no warning of the demolitions, making it impossible for them to remove most of their belongings. Owners interviewed by Human Rights Watch also said they had received no compensation. One local restaurant owner from the Qaboun neighborhood of Damascus told Human Rights Watch security forces arrived one morning unannounced with bulldozers and ordered him to leave the premises: “When I asked why, the soldier said ‘no more questions’ or else I would be detained.” He said they denied permission to remove anything from the restaurant and forced him to leave on foot, leaving his motorcycle behind. The report is based on detailed analysis of 15 “very-high resolution” commercial satellite images and interviews with 16 witnesses to the demolitions and owners whose houses were demolished. In addition, Human Rights Watch reviewed media reports, government decrees, and videos of the destruction and its aftermath posted on YouTube.